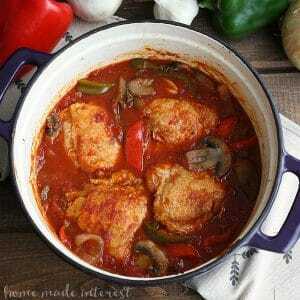 One Pot Chicken Cacciatore - Home. Made. Interest. 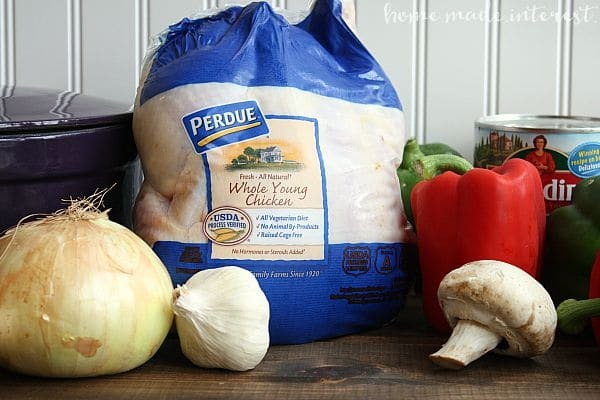 This post was sponsored by Perdue and BlogMeetsBrand. All opinions are 100% our own. 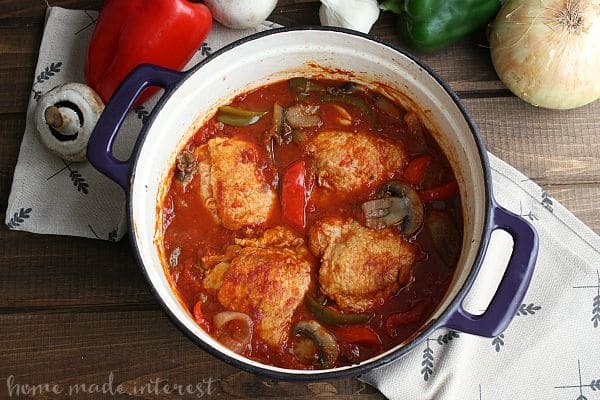 This One Pot Chicken Cacciatore is an easy dinner recipe that can be made ahead of time! This is my favorite time of year. The mornings are cool, the afternoons are warm, and at night it gets just chilly enough you want to snuggle down under the covers. This kind of weather makes me want to start cooking soups and stews, and braising beef and chicken. Hearty meals that cook for hours and come out of the oven full of flavor. Chicken Cacciatore is always at the top of my list when it comes to quick and easy meals for the fall/winter. It is simple to make, it doesn’t have to cook as long as a beef dish, and the flavors are amazing. It’s also great for sharing with others. It is good the night you make it and even better the next day so making a big batch of it ahead of time is the way to go. It freezes well for extra meals during the week, and it simple to double, or even triple the recipe as you go. 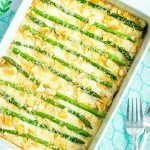 When I want to make a dinner to take to friends and family who need a little extra help this is one of my go to recipes. In fact, this is one of the dishes that I made and brought to Melinda after she had her son. I brought her two batches of it, one to eat right away, and one to stick in the freezer for later in the week. It gave her dinner for a few nights so she could focus on the new addition to the family. 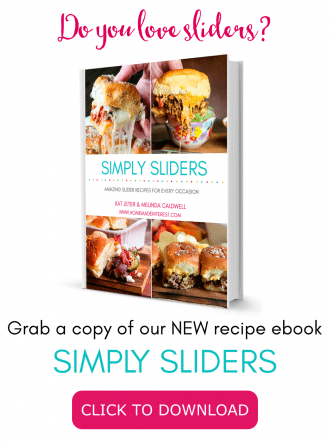 Another great thing about this recipe is there is no wrong way to do it. 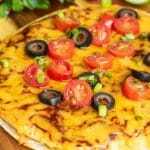 There are some basic ingredients that are a must have: bell peppers, onion, garlic, tomatoes, wine, and oregano. Then there are ingredients you can add to make it your own: mushrooms, carrots, celery, capers, thyme, turmeric, basil. Everyone has their favorite way to make it and I’ve never had a version I didn’t like :). The dish starts with chicken. I like to buy a whole Perdue Fresh Chicken and break it down. I prefer the thighs and drumsticks because I think this dish is best with dark meat, but if I’m cooking for a large crowd I use the chicken breasts too. The key to great flavor is leaving the skin on. You lightly flour the chicken pieces and then brown them in olive oil to get a nice golden crust and seal in all of the juices. If you have more chicken than you can brown at once no worries, just work in batches. Brown the chicken and then remove it from the pot and brown the next batch. 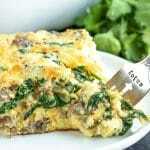 I make this whole recipe, start to finish, in my dutch oven. I couldn’t live without this thing! It is my #1 piece of cookware in the winter. Once the chicken has browned remove it from the pot, add a little more olive oil, and thrown in the veggies. 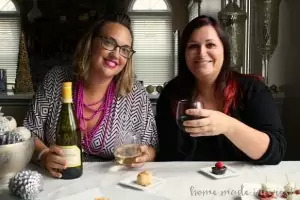 Let them cook for 5 minutes and then add the wine. I usually use white wine for this dish but you can use red wine too. As the vegetables continue to cook stir them around and scrape up the all of the browned bits of the bottom of the pan, they are part of what gives it such a good flavor! Let the liquid reduce by half, another 5 minutes and then add in your tomatoes and nestle the chicken into the mixture. Bring the whole thing to a simmer, put a lid on it, and keep cooking it over medium-low heat until the chicken is cooked through, about 30 minutes for the breast pieces, and 20 minutes for the thighs. You’ll know when the chicken is cooked because it will be fork tender and easy to pull apart. You can serve it over pasta, rice, or just by itself. 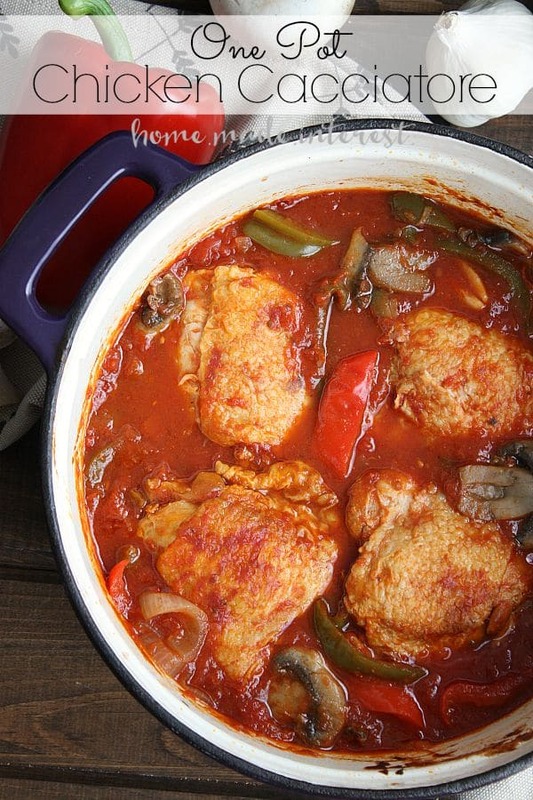 This one pot chicken cacciatore is braised in tomatoes with garlic, peppers, and mushroom for a deep, rich flavor. Salt and pepper the chicken and then toss it in the flour to lightly coat it. Heat olive oil in your dutch oven and, working in batches, brown chicken over medium high heat, about 3 minutes per side. 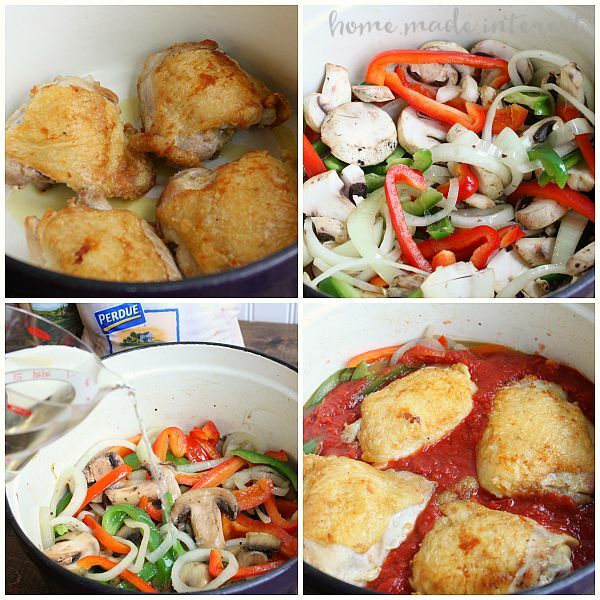 Remove the chicken from the pot and set aside on a plate. Add peppers, onions, mushrooms, garlic, and 1/2 tsp salt to the pot and cook for 2-3 minutes. Add wine and bring to a simmer, cooking until the liquid is reduced by half. Add tomatoes, broth, and 1 tsp of salt to the pot. Place chicken into the post nestling them into the sauce. Bring the sauce to a simmer and put the lid on. Cook for 20 - 30 minutes, until chicken is cooked through and tender. Serve over pasta, rice, or with a thick, crusty bread. I’m working with Perdue in the fight against hunger and to help feed families in need and you can too. Every time you redeem one of Perdue’s specially marked coupons for easy, convenient PERDUE® Chicken Products, Perdue Foods will donate 4 ounces of protein to Feeding America® to help provide a meal* through its nationwide network of food banks. *Feeding America guidelines: 4 ounces of protein = 1 meal. 1 meal = $0.10. ** Maximum donation: 450,000 pounds of protein. 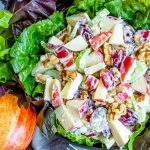 For more recipe ideas, product information, news and exclusive savings follow Perdue on Facebook and Pinterest. What can I use as a replacement for wine? Hi Nancy, you can use chicken broth in place of wine. Still delicious! Can you use marinara sauce instead of crushed tomato? Yes! Using a jar of marinara sauce is a great substitution. The list of ingredients doesn’t include how much garlic. Thanks for catching that Kathy! You should use 2-3 cloves of garlic. I am planning to make this today, however, when reading the directions I noticed you mention adding the garlic with the peppers, onions etc but the ingredients do not list garlic. How much garlic should I add and is it sliced or pressed? Thanks for catching that I’ll make sure to update the recipe. 2 cloves of garlic is good (I love garlic so sometimes I add more ;)). I usually just crush them and toss them in the pot.